The Society supports a number of awards and prizes to promote geographical education and research, and to recognise members’ efforts. Since 1947 the Lewis family have been the main benefactors of the tax deductable Fund that provides many of the awards. who has made a significant theoretical or empirical contribution to geography through the completion of a Master's Degree or a PhD. The medals will be awarded annually provided that there are students of sufficient merit. The Departments will each be invited to submit a suitable thesis by a student whose examiners' reports are formally accepted in each calendar year. The recipient is selected by SACE as the top student in Geography P, the publicly examined subject. The recipient receives the medal and one year’s membership to the Society. - First Year Geography -The recipient is selected by the University, and receives a certificate, $500 and a one year membership to the Society. - Second Year Geography - The recipient is selected by the University, and receives a Certificate and a two year free membership to the Society. - Third Year Geography - The recipient is selected by the University, and receives a Certificate and a two year membership to the Society. As long as appropriate courses are being offered. Major-General George William Symes CB MC settled in South Australia in 1949 after a distinguished career in the British Army during WW11. He took an active part in the life of South Australia and was Private Secretary to the Governor from 1956 to 1964. His interest in historical geography led him in 1949 to join the Royal Geographical Society of Australasia, South Australian Branch. When he died in 1980, he left a bequest to the Society with instructions that the interest from that bequest was to be used to provide awards for historical research into the history of South Australia and the Northern Territory in so far as the latter affects the history of South Australia. The G W Symes Award is conferred at the Society's Annual Awards evening. The award will comprise a formal certificate of recognition and a cash prize. The Society has determined that the Award should be made to a worthy recipient who has authored an academic, peer-reviewed paper that relates to the history of South Australia (or the Northern Territory in so far that is affects the history of South Australia, recognising the intimate historical links between these two jurisdictions) and that is substantially informed by the discipline of geography. The papers to be considered may include already published papers or papers authored as part of an undergraduate or masters thesis. The paper should have been finalised in the last two years. Any authors who wish to have their works considered for this prize should submit them to the Society no later than 31 December each year. The Society will consider all papers that meet the above criteria and the decision of the Society will be final and in its complete and unfettered discretion. Criteria and application forms are available. The Centenary Silver Medal shall be awarded to a past or present member of the society in recognition of outstanding service to the Society as evidenced by long and active service on the Council and/or Committees of the Society or by significant contributions to the varied activities of the Society. Medal recipients are listed on the Membership page. A Fellow may be nominated to the Council by the Research and Awards Committee or by any financial member, at any time. Nominations are to be vetted through the Committee and any recommendation put to the Council. Fellows receive a citation and will continue to pay membership fees unless also awarded Life Membership. Certificates are awarded at the Annual Dinner to those members who have held 50 years of continuous membership of the Society. 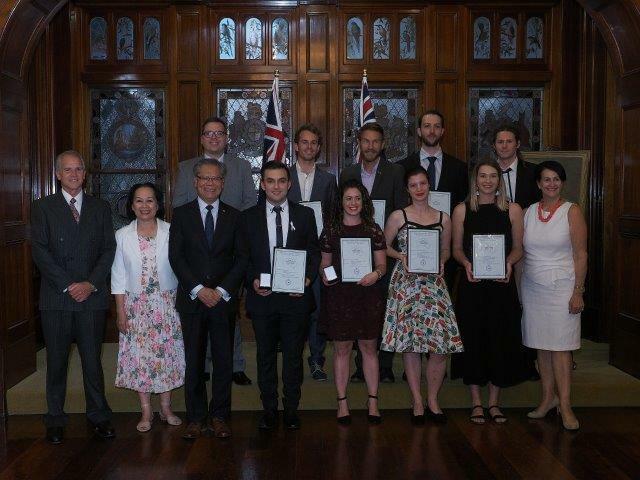 Members who advance to this category are recognised with Life Membership and a certificate. For any queries, or to nominate a person for an award, email the Society on admin@rgssa.org.au or 'phone (61) 08 8207 7265.